If you've outworn your favorite summer sundresses and you're simply not in the mood to wear a jeans-and-tee pairing, we hear you. We all need a bit of variation in our wardrobes, and luckily, each season, retailers unveil fresh, fun pieces that instantly grab our attention. As such, we always like to reveal what is currently filling up our editors' online shopping carts (they do know best, after all), from the stylish summer tops they've been wearing nonstop (ribbed tube tops, polo shirts, and milkmaid blouses, to name a few) to the prettiest pattern skirts they've been coveting as of late—the latter of which we're honing in on today. While we're all for crisp, classic, and minimalistic staples, everyone's closet can benefit from a bit of TLC in terms of those eye-catching, maximalist printed pieces. 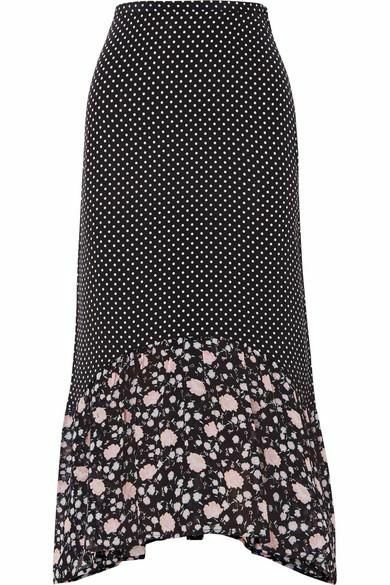 And a pretty pattern skirt is one of the easiest, breeziest ways to incorporate a bit of playfulness into your everyday attire. Because of this, we're highlighting the mini, midi, and maxi styles that are editor-approved, from a '50s-inspired polka-dot midi to a rainbow-striped maxi. Trust us— these skirts certainly deserve a spot in your summer outfit rotation. Read on to shop a highly curated edit of the best pattern skirts to wear now. Available in Italian sizes 38 to 42.